International Journal of Research in Health Sciences,2015,3,1,24-28. 1M.B.B.S., M.D (Medical Physiology), Associate Professor, Department of Physiology, Topiwala National Medical College & B.Y.L.Nair Charitable Hospital, Mumbai, Maharashtra, INDIA. 2M.B.B.S, M.D (Medical Physiology), Assistant Professor, Department of Physiology, Dr.Vasantrao Pawar Medical College,Adgaon,Nashik, Maharashtra, INDIA. 3M.B.B.S, M.D (Medical Physiology), Assistant Professor, Department of Physiology, Dr.Vasantrao Pawar Medical College,Adgaon,Nashik, Maharashtra, INDIA. Introduction: Stress is an adaptive response of organism towards a noxious or threatening condition. Exam stress is a common condition faced by students and is quite predominant among medical students. Reaction time is an index of sensory- motor performance. The study was conducted to assess the impact of stress on reaction time in medical students prior to examination. Choice reaction time was used to evaluate the cognitive performance of students. Exam stress acts as an acute stressor and is known to affect the cognitive functions. Materials and methods: The study was conducted on 60 healthy second MBBS students between the age group of 18 and 20 years, at Topiwala National Medical College. In this study, digital reaction time apparatus, manufactured by Bio-Tech., with the maximum time resolution of 0.0001 seconds, was used. Randomly occurring visual and auditory choice reaction time tasks were presented to the students. After adequate training, three sets of recordings were taken. First set during stress free period, and the second & third sets were taken 20 minutes before the first terminal and second terminal practical examination respectively. 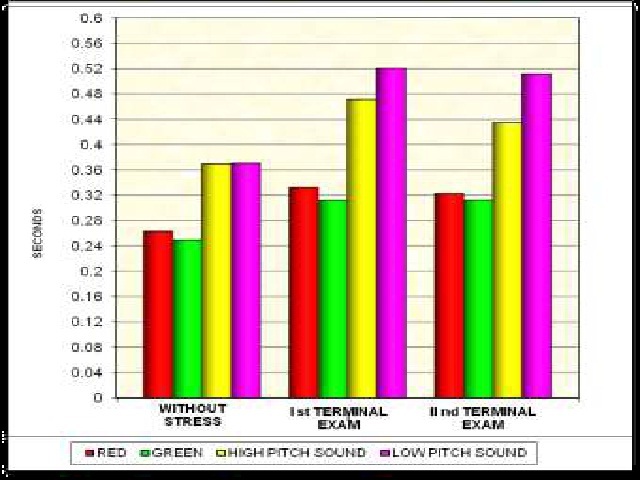 Results:- The readings were analysed by paired student “t” test and results showed that the exam stress prolonged both visual and auditory reaction time. Conclusion:- The study shows that exam stress affects the performance in medical students.